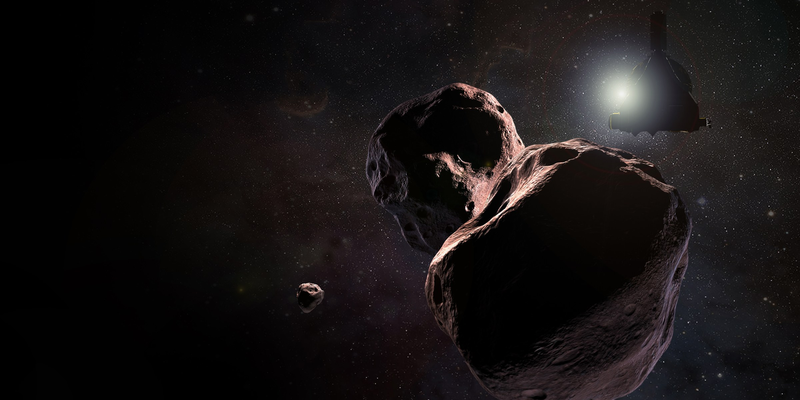 NASA’s New Horizons probe will be making a near approach to a distant object in the Kuiper Belt, nicknamed “Ultima Thule”, tomorrow, Jan. 1, 2019, Chicago time. You can follow the progress at the Johns Hopkins University Applied Physics Laboratory New Horizon’s webpage, with links to televised events here. An artist’s conception of the flyby (from NASA/JHUAPL/SWRI). Televised events are ongoing, and as I write this, a briefing is being streamed on NASA TV’s YouTube channel. “Thule” was a place described by the 4th century BC Greek traveler Pytheas as being 6 days’ sail north of Britain, and “Ultima Thule” became a phrase meaning “the furthest place on Earth” (it is also, I have just learned, the name of a planet in Star Trek: DS 9). “Thule”, or some variant thereof, has been given as a name to a variety of places, most notably part of northern Greenland, where there is a US-Canadian-Danish air base. Officially named 2014 MU69, the Kuiper Belt Object’s nickname refers to its having the distinction of being the furthest object in the Solar System to ever be closely observed by man. This entry was written by whyevolutionistrue and posted on December 31, 2018 at 3:31 pm and filed under astronomy with tags Kuiper Belt, New Horizons, Ultima Thule. Bookmark the permalink. Follow any comments here with the RSS feed for this post. Both comments and trackbacks are currently closed. The Deep Space Network page currently has 5 active antennas talking to the probe and one other committed (or possibly on teardown). I imagine things are pretty busy, and exciting, at NASA right now. Down to three now – the Canberra dishes. No data coming down (the spacecraft is oriented for science, not communications) so I assume the dishes are looking for abort signals. … and a planet on Space:1999 (the old Gerry and Sylvia Anderson series). Appears on several Classical era maps, sometimes referencing identifiable places (Orkneys or Faroes, Iceland, Greenland), sometimes as a marine cognate of “here be dragons”. I see the date and that it’s Chicago time, but I don’t see the time Chi-town time. See the link in the OP on televised events; it gives times of various events in Eastern Standard (i.e. New York) Time. I find one of the most amazing things about this flyby is that it takes over 6 hours for light to travel one way between Earth and the New Horizons spacecraft. This can be taken two ways: (1) light is fast but not that fast or (2) Ultima Thule is really far away. (3) Space is a vast and lonely place. (4) Human beings are impatient. If the “Breakthrough Starshot” project goes ahead, then the two-way time for transmissions will be up to 7 years. Some people reading this blo^H^H^Hwebsite “live” today are likely to be fretting at that wait. And just what are these craft supposed to do when they get there? Send a telegram? At 1/2 the speed of light they would take 8.7 years to get their and the telegram would be received after about 14 years. The younger members of the research team would likely still be alive, so perhaps there would be a sense of fulfillment and completion. I imagine that by the time this is launched we will have a much better idea of what planets exist in the target system. They would be programmmed to send back spectral and other data on those planets, particularly anything suggestive of life. It would be nice if the spacecraft could be programmed to go into orbit around the star and monitor the planets for a period of years. Perhaps land on them and send a little sample of whatever slime might exist back to us. 20 or 30 years round trip. 8.7 years to get there, but only 12.2 years for data to come back. Have you ever worked with 1 bit/second data? It makes you really, really wish for 2 bits/second. Once you’ve gone to the effort of building your “launching lasers” there is no reason to not keep launching the things, to provide a “bucket brigade” low power return data line. Sorry, where was I? Hit the wrong button. Bucket brigades do slow the signal, but not hugely. The “Starshot” has interesting potential. In particular, by starting the deceleration well this side of the half-way mark you can actually bring the spacecraft to a relative halt in the target system using the solar sail. Which opens up a metric shitton of possibilities. There are also trajectory designs that can drop the spacecraft to “rest” in Proxima orbit by doing a slingshot and aerobrake manoeuvre around the stellar wind of Alpha+Beta. Build your “launching lasers” on the Moon and you’ll get a launch window for a day or so every month. But in the same month you’ll get launch opportunities for several other target star systems. Verily, we live on the edge of “interesting times”. Of course, humankind will probably kill ourselves or bomb ourselves back into the stone age before we do that, but that’s just a way of answering the Fermi Paradox. The way things so often happen, we’d probably get halfway down the road to stellar discovery when, BOOM! Out of the blue(so to speak) some nerd would invent warp drive and put all those engineers off on a new project. Humans to Alpha Centuri in 20 minutes. Bring your cell phone and lots of fresh film, you’ll want to take pictures. (no pets please. Weightless, they vomit). Weightless vomiting (and otherwise shedding) pets will be put in CO2/O2-permeable but fluid-impermeable bag and sealed at the check-in gate. You will be given a device capable of opening the bag as you leave the baggage hall, but you will be charged for clean-up costs if you open the bag on airport property. There is probably a law of nature that the law-breaking laws of nature (like your 20-min-to-Alpha drive) only get discovered when just doing things the brute force hard way. Rutherford (in the personas of his graduate students), for example, was tediously mapping the distribution of matter in the “plum pudding” model of the atom, when he discovered the nucleus. Hundreds of thousands of scintillations recorded and logged. (3′) Space is big. Really big. You just won’t believe how vastly, hugely, mind-bogglingly big it is. I mean, you may think it’s a long way down the road to the chemist, but that’s just peanuts to space. In the outer solar system, the typical spacing between “continent-size” bodies (Pluto-Charon, Ultima Thule, any of the about 2000 KBOs with characterised orbits) is similar to the Earth-Sun distance, which contains three planets and several hundred asteroids. lots of room to maneuver. I suppose collisions were much more frequent 5 billion years ago and then tapered off to near zero. Maybe a nice place to retire. Yeah, that’s one of the questions the mission is intended to address. I’ve seen estimates that the crater count might be as low as a few dozen if MU69 really has spent all it’s time in the “Cold Classical Kuiper Belt” (“Cold” referring to the dynamics, not the thermodynamics), compared to the tens of thousands on Pluto-Charon, which has the dynamics of a body that was somewhere else and then was scattered to it’s current orbit. The Kuiper belt is far compared to other planats. IIRC there is even a more distant part of our solar system, the Oort cloud. It is a ‘not-yet-observed’ cloud of comets reaching up to halfway our nearest star. Thanks for the added commentary on the etymology of Ultima Thule. Thule sounds like a name out of Lord of the Rings. Tolkein knew his Classics – his day job was understanding Olde Ynglish, Oldier Norse and Icelandic and how they contributed to forming Modern English. So a name made up by classical authors to refer to places in the distant north, when they did have some contact with people from that area – well, it sounds like Tolkein’s job was done well. It took two years to download the science and image data from New Horizon’s Pluto encounter. At 2000 bits per second! Not only does it take a long time for the photons to travel but they get really spread out. Next time NASA should pony up for soliton wave technology or, even better, the subspace option. The photons can’t spread out in time, they all travel at exactly the same speed. But it must be very hard to reliably transmit bits over such distances, because the signal must be very weak relative to noise. So there is probably a lot of redundancy in the coding. What I should have said was, the radio beam spreads out so that there are fewer photons for the receiver to capture. They’re getting 500 to 800 bits/second now. Where’s my acoustic coupler? Must Ultima Thule be pronounced Ultima Tooley? Where’s the mystery? Apparently, it’s an Americanism. The UK pronunciation remains “THEW-lee”, and I’m sure next week’s “Sky at Night” special will litter the cutting room floor with “what did you say?” sections. I think the in classical times Ultima Thule referred to far away parts that are now considered parts of Norway, Iceland or even Greenland. Can’t remember the source though. Brian May’s new song “New Horisons” is now up on YouTube. My friend is watching Nasa live and they are getting data. According to the DSN page it is at a massive 500 bits per second – and at that distance this is no sarcastic use of the word massive! Mind you, it is going to take them a wee while to download the mass of data that they accumulated (fingers crossed 😀 ). I just came here to post that same. 500bits/second is an awful lot better than 1 bps. This is just a “health check” on the spacecraft (all major systems reported green), which will then go back to imaging the body. The main data will be coming down over the next couple of years. As the spacecraft gets further from the target the already low chance of a collision that destroys or disables the spacecraft continues to decrease. So we can fairly confidently anticipate getting most of the data down. The remaining major hazards are a cosmic ray strike bowdlerising one or more bits of the data (manageable) or scrambling the operating software (also manageable for many cases). This is incredibly cool! Thanks for sharing it!